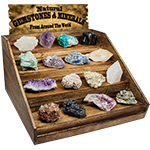 Our Magnetic Hematite in Mine Shaft Display Package is an eye catching attraction that will draw your customers in! 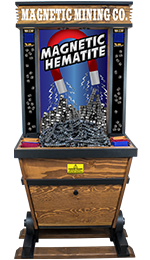 Our Magnetic Hematite in Mine Shaft Attraction features metal inserts on the arms that the Magnetic Hematite will stick to, a Magnetic Hematite graphic that will attract attention, LED lighting, a storage compartment and a FREE customized sign with your company or landmark name! The display will hold 75 lbs of Magnetic Hematite and the excess can be stored in the storage compartment below. Wow your customers by customizing your felt bags with you logo or name for an additional 15 cents each. Please call for details. Shipments requiring a lift gate, inside delivery, limited truck access, residential delivery, notification calls and/or a delivery appointment, must be requested at the time of order. You will be invoiced for all Accessorial Fees incurred due to delivery restrictions, including charges for additional delivery attempts. You will be billed the actual amount of the accessorial fees charged by the carrier.